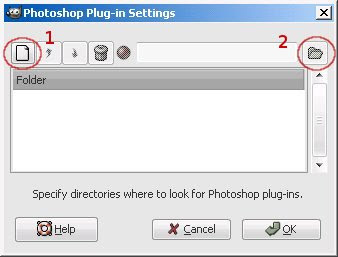 There are many great free Photoshop plugins available on the web but for using it we not necessary to have Photoshop installed on our PC. We can use any photo editor that compatible with Photoshop plugins format. 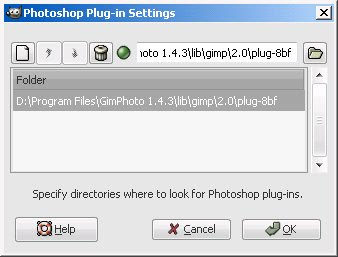 GIMP have no support for Photoshop plugins but one great GIMP programmer, Mr. Tor Lillqvist is make GIMP plugin that can use Photoshop plugins, that plugin is called PSPI (Photoshop Plugins Interface). Actually PSPI only works under Windows because it’s depend on Adobe Photoshop Plugins SDK that only available for Windows. But PSPI also can be run under Linux using Wine. Not all Photoshop plugins format can be used with PSPI, only plugins with extension .8bf that can be use with PSPI and not all .8bf plugins can be used, so we must tested it first before can using it. I will try to review each free Photoshop plugins that useful with PSPI under Gimphoto and their limitations. PSPI is distributed with Gimpad installer, so if you already download and install Gimpad then PSPI is ready to use on your Gimphoto. 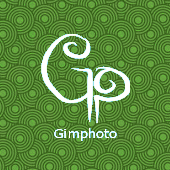 Download Gimpad installer and it will install Gimpad, PSPI and free VirtualPhotographer plugins. After click the Menu then will appear dialog to set the Photoshop Filters Path. Click on New Icon (1) and then Folder Icon (2) to Browse the directory at your harddrive. You can also select many different folders for your installed Photoshop plugins that available at your computer harddrive. After selecting the folders location then click OK and close the Gimphoto and restart it so Gimphoto can re-scan all the folder, query all Photoshop that available to be use and create new menu for that plugins at bottom of Photo Menu. After plugins available under Image Menu > Photo > VirtualPhotographer then we can try by clicking it to make sure that plugins is can be run and and working Ok under PSPI for Gimphoto. TIPS: Try to install plugins one by one then testing it extensively before install another plugins. Beware before using non-tested plugins for professional work because sometimes not compatible plugins can cause computer hang or close application directly, so work safe by save it frequently. I tried to install VirtualPhotographer Plugin but if i open a file, it's not showing in gimpad. but it's ok if i only run GimPhoto.any suggestion? But by the way, great work. I also want to get rid of my pirated Photoshop. I tried Gimp so many times but i just can't get the feel of it. But with your work, you made it possible. Thanks! for VirtualPhotographer plugins, like you saw at my tutorials, i can used it with GimPad using Windows 2000 and XP without problems. Maybe you can be more specific about your OS, is the plugins other function working properly beside image loading? and also testing it using other plugins, is the same problem happens? memang ada sebuah bug di modul PSPI yaitu di bagian preview karena GIMP sejak versi 2.4 melakukan perubahan pada cara kerja previewnya sedangkan PSPI belum mengadaptasinya. jadi banyak plugin yang bermasalah di bagian previewnya, selama kita tidak mengubah-ubah previewnya maka plugin itu berfungsi normal. that would be even more awesome than gimphoto is now!! Thanks for your suggestion, i will include GMIC in Gimphoto next version. Hello. Great program. Can you upgrade gmic? I tried to add the latest filters on it but link might of changed. Is their another way yo install latest gmic? Also i saw a nice color grading plugin for gimp using color wheels. But gimphoto doesnt recognise. Is their a way to add gimp plugins to gimphoto? Thank you for all your hard work.